Reducing the information superhighway to fast and slow lanes would no doubt pave the way to chaos on the roads on which millions of ordinary Americans travel daily. We would witness terrible bottlenecks and breakdowns, insufferable congestion and gridlock, and relentless construction work and impossible detours. If the internet behemoths have their way, Gat warned, “you will stream Netflix faster than you read the New York Times, if Netflix chooses to pay for it.” And the start-ups, the nonprofits, and all those individually maintained websites would presumably stall into obscurity. I wonder, though, how significant net neutrality is for contemporary artists, especially those who work closely with digital media. Based on this panel discussion, the issue doesn’t seem that important, but related topics—such as how the corporatization of the internet affects artists and the definition of postinternet art—are of particular interest. Gat, a writer and editor for Rhizome and WdW Review, quickly gave a chronological history of the web as it intersected with digital art. While working at CERN in Switzerland, the British engineer Tim Berners-Lee invented hypertext transfer protocol (http) in 1989. Internet art grew in the early 1990s, she continued, helped along when US Congress passed the Telecommunications Act of 1996, which greatly expanded online access for many citizens and businesses. Artists have influenced the web’s look and feel as we know it today much more than we realize, Gat said, and that internet and postinternet art developed simultaneously. This makes sense—thinking about Web 2.0, you can’t theorize the massive influence of Facebook and OkCupid, which launched in 2004 and run at full steam today, without considering LiveJournal and the Makeout Club, both founded in 1999 (but now puttering along). Despite the term “post,” Gat insisted, there is no art after the internet. Rather, postinternet art is a product of, and a response to, the changing digital landscape. The first speaker was Gene McHugh, a writer and curator known for the blog Post Internet, who spoke biographically. The mainstream migration of people to the web, he said, took place in the late 1990s, when he was in high school. “I was an internet addict,” he said. “My identity was as much online as it was a body sitting there typing.” I was relieved McHugh advocated a synthetic view of a person’s relationship to digital culture, instead of trotting out the clichéd internet/IRL divide. McHugh explained Guthrie Lonergan’s term “internet aware art” as meaning offline art made with the internet in mind, or art made with an eye toward how it will look online. Considering time as an element, McHugh theorized that multiauthor projects such as the Jogging and Dump.fm, as well as surfing clubs, can be understood as performance, since you can follow this activity online but in real time. He also identified Marisa Olson, Cory Arcangel, and Michael Bell-Smith as artists exploring this kind of art in different ways. The second speaker, the artist and writer Tyler Coburn, wanted to define postinternet, and especially that nagging prefix “post.” Instead, he read a formal, polemical, and somewhat difficult-to-follow artist’s statement that addressed the art market and art history. “The current market for postinternet art,” Coburn claimed, “is nothing if not robust.” He was less optimistic about periodization, which constricts some artists and renders others illegible. I don’t, however, find it unreasonable to group together similar artists and their work for the sake of convenience, acknowledging, of course, that such categorization doesn’t always make sense at a granular level. As problematic as they might be, terms like Cubism, Minimalism, and Abstract Expressionism simply work. As much the term postinternet makes its supporters anxious, it still allows them to slide their work into a relevant discourse. 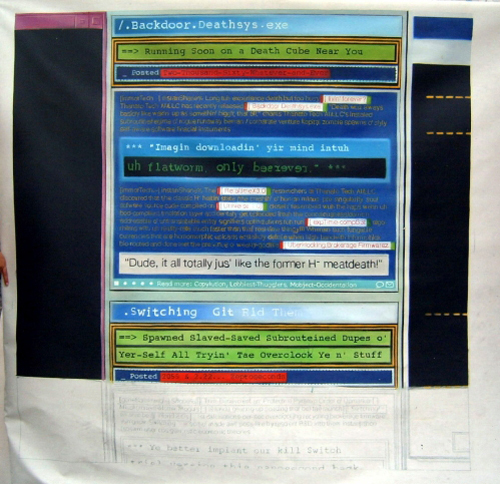 Regarding his own critical practice, Coburn firmly stated: “My work attempts to disenchant the dominant metaphors and mindsets at work in contemporary technology.” The reflexivity and opacity of digital infrastructure concern him greatly, as do finding a digital space outside Facebook and exploring emerging methods and practices, whatever those may be. He named Benjamin H. Bratton and Ann Hirsch as people doing critical work and cited his own project, I’m That Angel (2012–13), which took the form of a physical book and several readings inside data farms around the world, as another example. Christiane Paul, a professor and program director at the New School for Social Research and an adjunct curator of new media arts for the Whitney Museum of American Art, ran through highlights of a previous talk called “The Network Space,” which chronicles the transition from web 1.0 and web 2.0—in particular the move from publishing (e.g., personal websites) to participation and broadcasting (blogging)—through works of art. She mentioned Mark Napier’s browser mash-up Riot (1999/2000); Paolo Cirio and Alessandro Ludovico’s Lovely Faces (2011), a fictitious dating website created from scraped Facebook profiles; projects such as Jennifer Ringley’s JenniCam (1996–2003) and its commercially oriented spawn, lonelygirl15 (2006–8); and Aaron Koblin’s crowd-sourced drawings for The Sheep Market (2006). According to Paul, “There’s nothing post in postinternet” art, which she described as work that is “deeply informed by networked technology” and is digitally aware but takes the form of material objects. Paul’s canon of postinternet artists includes Rafaël Rozendaal, Clement Valla, Petra Cortright, John Raffman, Evan Roth, and Katie Torn—artists who have emerged in the past few years. For me, some of the best work about the internet (using Paul’s formulation) came even earlier and often took offline forms. Seth Price’s ongoing explorations of digital distribution (since 2000), Adam McEwen’s drawings of text messages from a Nokia phone (ca. 2006–8? ), Shane Hope’s rickety laptops built from painted wood scraps (2006) and his paintings of imaginary digital-device screens (2007), Ryan Trecartin and Lizzie Fitch’s bizarre videos (2006–present), and even Dana Schutz’s Google (2006), where she sits in her studio entranced by the offerings of the almighty company’s Image Search—these artworks, made by fairly traditional and post-Conceptual artists (and not necessarily creators of digitally sophisticated forms), explore the condition of interacting with digital networks and technologies. On a side note, one of the most brilliant artworks of the George W. Bush era was Ramsay Stirling’s animated GIF, Enduring Freedom (2008). Anyway, postinternet art takes on a physical form, Paul reminded us, but whether or not a viewer understands the concept of the form (or its subject matter) is another issue. Like Gat before her, Paul noticed the increasing corporatization of the internet during the 1990s but, in slight contrast to Coburn’s celebration of sales of postinternet art, stated that the market for internet art hasn’t changed since the 1990s. How do these observations square with Rachel Greene, who ten years ago wrote that “as yet, there exists no viable or stable market for net art.” Furthermore, Paul vaguely described an antimarket attitude among postinternet artists, who are “savvier” in some undisclosed way. It’s not clear to me how artists working in the digital realm are making money—or not—based on these three assessments. The conversation among the panelists after their individual presentations progressed productively. McHugh argued that first-generation net artists, who had trained academically, were happy working in the margins, and that younger artists would have used paintbrushes, too, if they hadn’t grown up digital. Nevertheless, he said, those younger artists still want the white-cube experience. Gat complained that much digital art ends up looking the same, aggravated by the ubiquitous use of Facebook and products from Google (and Google Earth in particular). She wondered if artists are problematizing the operations of these corporations or are complicit with them. I sympathize with her wariness of the dependence on proprietary corporate platforms. If Tumblr, which allows people to use their own domain names for their microblog but doesn’t offer back-end programming access, pulled the plug tomorrow, the content for every site would likely disappear with it. Conversely, platforms are occasionally abandoned en masse by their users. Remember all those indie bands that created MySpace pages instead designing their own stand-alone websites? Well, they’re on Soundcloud and Bandcamp now, because that’s where the audience is. The question is, how much self-sufficiency should an artist relinquish to reach that audience? McHugh said that postinternet art aims for a larger audience beyond the art world. Paul doesn’t see Google taking over art with a nonexclusive right, and there are ways to combat marketing, such as, for example, by “liking” everything. The idea of audience intrigued me. I wondered how much contemporary digital art—especially the stuff using Google Maps or Twitter—would be interesting to your typical Silicon Valley entrepreneur? What would highly skilled programmers and designers make of work by all the artists mentioned during this panel? Probably with the same kind of amusement that a 1970s Hollywood filmmaker would have when viewing early video art by William Wegman and Vito Acconci. Similarly, what kind of distinctions would contemporary programmers and designers make between an art-gallery video and an amateur YouTube clip? We’re now fully immersed in the world in which the gap between art and life has ceased to exist. Would avant-garde artists who championed that notion one hundred years ago be horrified or pleased with early-twenty-first-century practices? An audience member had the same idea and queried the panelists about differences between avant-garde or critical artists and the general public when both use the same digital tools. The gap has collapsed, McHugh said, but artists are examining issues other than these products, such as the physical and environmental impact of cloud computing. But that is also an important topic for mainstream media, especially in states such as North Carolina, where Apple has built several solar-powered data farms. Paul said that while some artists produce interesting work from behind the curve, most of them are “by nature and statistically” ahead of the curve, waiting for the technologies to be invented for their use. Char Davies, she recalled, was a frustrated painter who in the 1980s helped create Softimage, a software application for three-dimensional image creation that was later acquired by Microsoft in the 1990s. That happened twenty years ago—which artists have done something like this recently? Another audience member linked the web’s founding in 1989 to the fall of communism and then asked about digital natives of technology and of “markets as the only way of organizing the world.” Is postinternet a condition, he wanted to know, and not a subgenre? “I would say absolutely, yes,” said Paul. “It’s not an art movement. It’s not an art genre.” She acknowledged that (art-historical) acceptance comes from the market, and that museums look to the market for validation. For her, artists and critical practitioners must therefore denaturalize the present condition and create suspicion, whatever that might be. McHugh wondered about the critical role of writers and curators, of articles and exhibitions. I’d say all of that is highly important to the development of both internet and postinternet art, which is still very much up in the cloud, I mean, in the air. In Terms Of count: 12. Funded in part by a grant from the Arts Writers Grant Program, Post Internet published regularly for most of 2010 but was then taken offline. McHugh’s collected posts can be read online or downloaded as a PDF for free, or purchased as a print-on-demand book from Lulu. 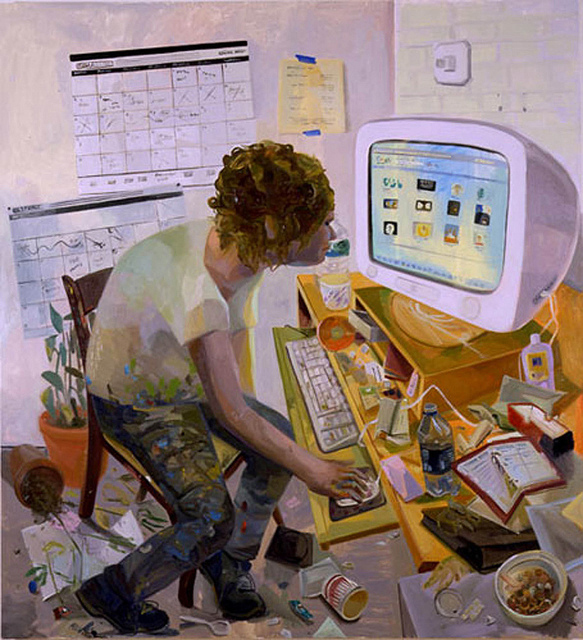 For a superb essay on Schutz’s painting Google, see Steven Stern, “Image Search,” Frieze 106 (April 2007): 136–41. Rachel Greene, Internet Art (London: Thames and Hudson, 2004), 31. Frieze Projects New York has posted an audio recording of this panel.